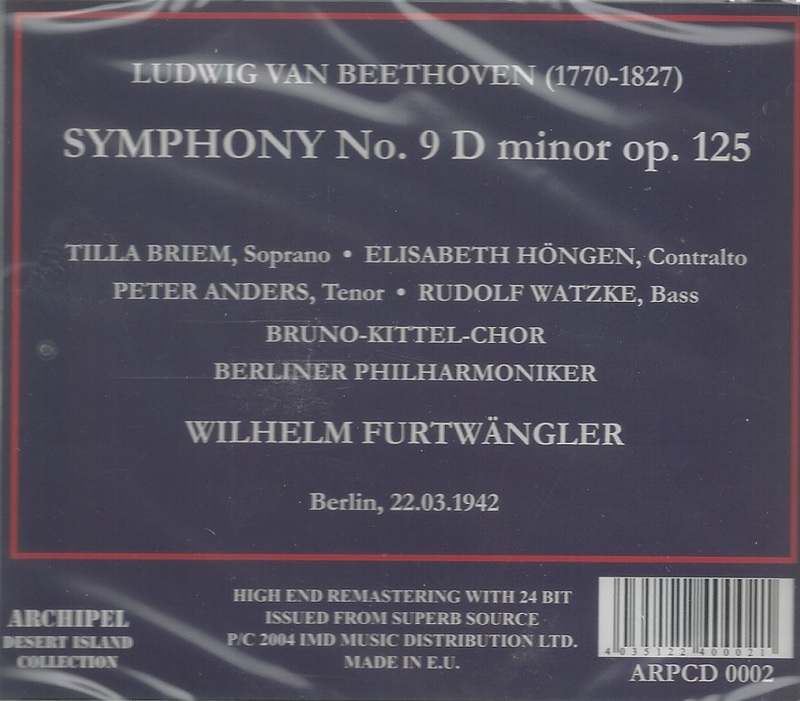 “This is a famous recording among collectors, particularly Furtwängler specialists. 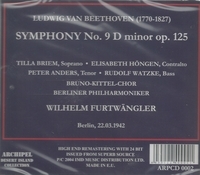 Known as the ‘wartime Ninth’, its reputation is based on musical and extra-musical matters. Those who are critical of Furtwängler’s choice to stay in Germany, despite never joining the party and giving the Nazis considerable difficulty many times, feel this performance stands as a symbol of a man trying to make life-affirming music while governmentally legitimized murder was going on around him. Others point to the fervor and even fury that seems at the center of the performance as evidence of the conductor’s true emotions about the government he was living amongst. (I just finished reading Berta Geissmar’s THE BATON AND THE JACKBOOT, the memoirs of Furtwängler’s assistant until she had to leave because of her partially Jewish roots, which gave a fascinating and horrifying personal account of those times). Then there are the purely musical reasons for its fame. 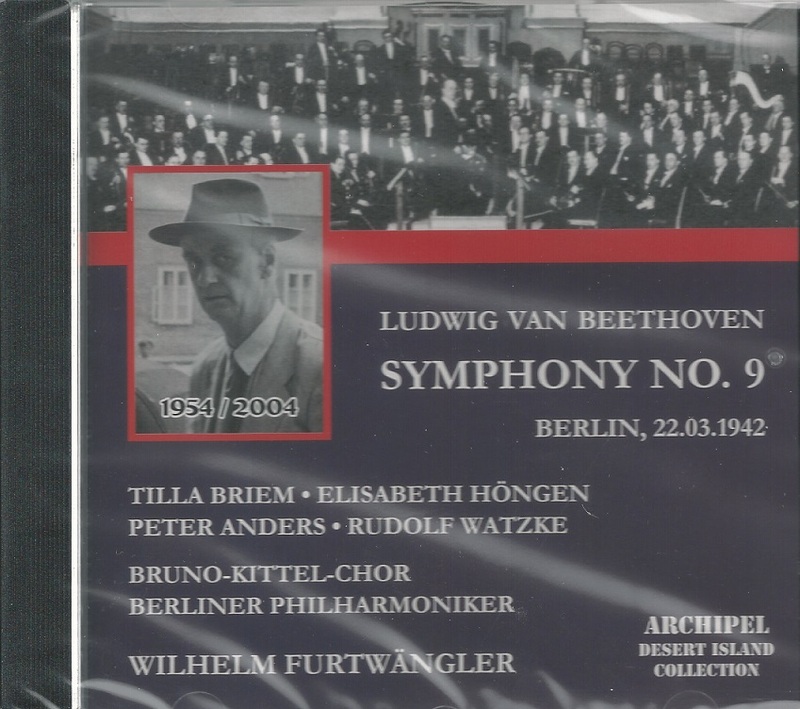 While this is similar in interpretive profile to all surviving Beethoven Ninths conducted by Furtwängler, it is a magnified, intensified version of that profile. You are unlikely to encounter, on disc or in the concert hall, a ninth as passionate, as wild, as extreme as this. Climaxes are executed with a fury. The timpanist is explosive throughout. There is not a single phrase that is thrown away, or performed without its role in shaping the whole. Strings dig in, winds blow with extra pressure, everything is larger than life. The hushed Adagio is particularly intense and moving. The end of the symphony is almost mass hysteria. This is not a Ninth to listen to regularly. One of its great assets is the element of surprise, even shock, when one hears it. That will disappear if it becomes your ‘normal’ experience of the piece. Is it too much? Is it ‘over the top’? That depends, one supposes, on each listener’s personal reaction. For me, absolutely not. It is an unforgettable performance of music being made by an orchestra, chorus, and four soloists that is coming from deep down in their collective gut—one which I choose to hear as life-affirming. It is certainly not a ‘routine’ performance in any sense of that word, and given the revolutionary nature of the Symphony it strikes me as just the kind of performance this work should get. I recognize that for some, it will be impossible to listen to this in the context of what was going on in Germany at the time and not be repulsed by it. While that is not my reaction, it is certainly an understandable one. … Furtwängler was a, "genius compounded of intellectual directness and an almost excessive shyness whose timidity made him efface himself in any gathering, but who had such a great attraction for women that, if they did not fall victim to his musical genius, [they] were fascinated by his personality."